All transactions are safe and secure with a reliable history in online purchasing behind each of our associates. Buy the I Know Him! Elf Santa t-shirt to own Elf clothing and merchandise. When Buddy's boss at Gimbels makes the announcement that "Santa is coming to town" the following morning and will be at the store to take pictures at 10 a.m., Buddy exclaims in a burst of excitement, "I know him!" He then lets another employee, also dressed as one of Santa's helpers, in on the announcement. 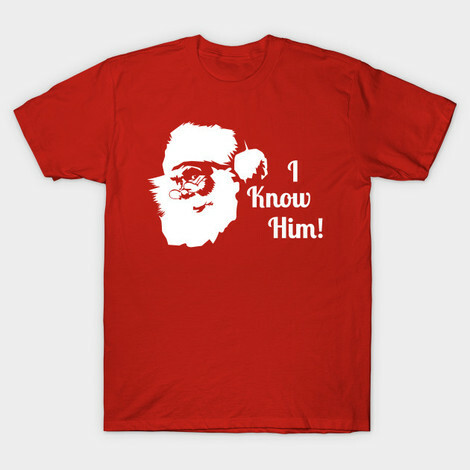 This design informs everyone that you know Santa too. In addition to the I Know Him! Elf Santa tee above, browse the Elf Clothing Gallery for more apparel like men's and women's clothes, kids shirts or hoodies.